This quilt was finished back in August just in time for the 1st birthday of a special great nephew who has already undergone several surgeries for a bilateral cleft lip and palate. And when nothing else can comfort him, Mickey Mouse can. He loves Mickey Mouse! 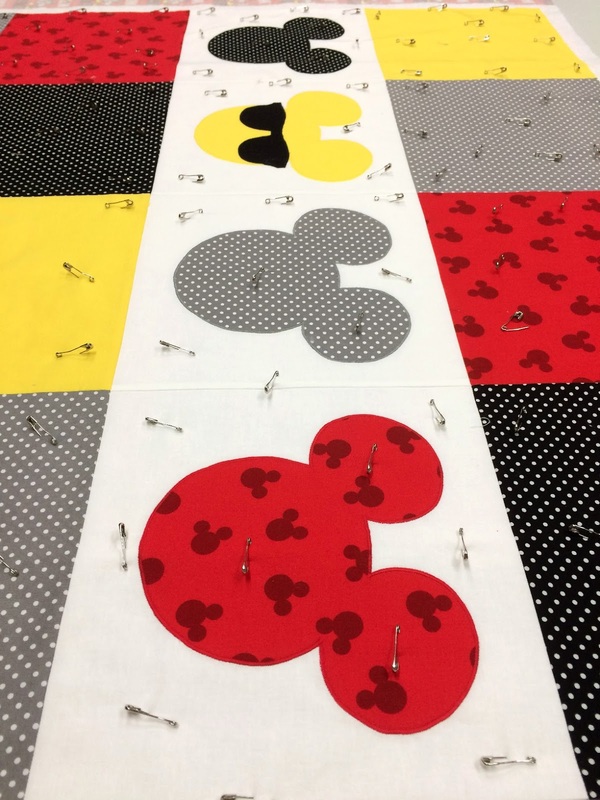 I had the idea of a simple Mickey Mouse quilt, but finding licensed Mickey Mouse fabric was not so simple. With a quick online search, I found a cute print and set out for my local Walmart which was supposed to have the fabric. They did and when I found it, the fabric was 100% polyester, not what I had in mind or would use. The only cotton print they has was the red silhouette fabric which became the inspiration for the quilt. 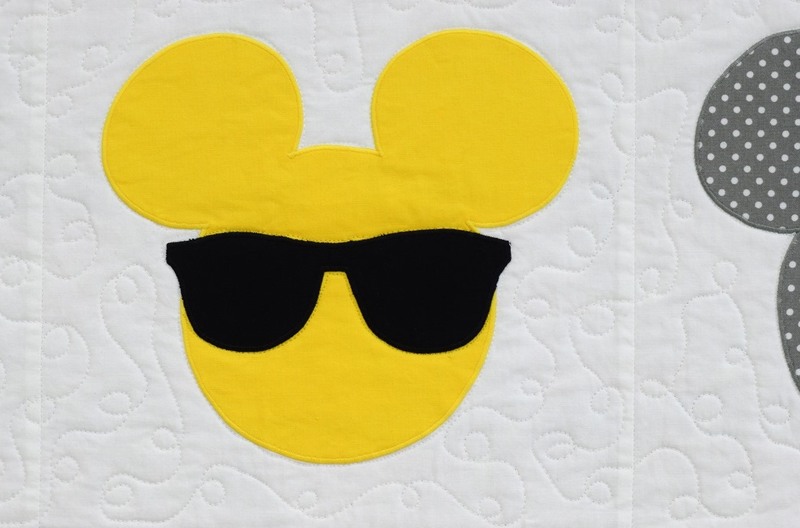 While researching, I saw sunglasses on a Mickey and thought that would be cute on the yellow silhouette. 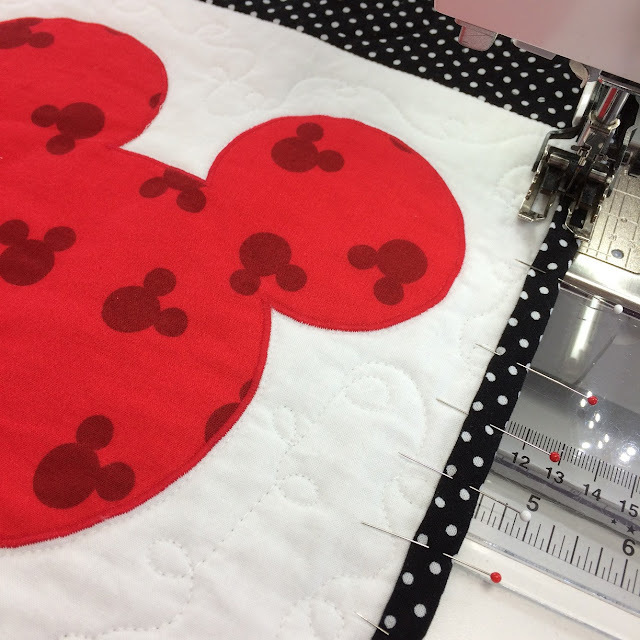 I machine appliqued the Mickey Mouse silhouettes using matching 100% cotton Aurifil 50 wt. The gray and black dot fabrics are by Waverly and were purchased at the same time I found the Mickey fabric. The yellow Kona I had in my stash. I cut the squares 10 1/2" thinking I would have a nice sized quilt, 40" x 50", and be able to use a width of fabric for the backing. I would be WRONG. The backing shrank to way less than 40" and was printed very crooked. The top came together quickly and here it is pin basted and ready to quilt. I first secured the blocks by stitching in the ditch around each block and quilting very close around each Mickey head. Which each block I changed thread colors to match the block. I quilted meandering loops in all the blocks. I tried to plan it where I could travel diagonally between the blocks as I quilted. Fortunately , I had all the colors of Aurifil in 50 wt., I needed for quilting. Matching the red, white, black and gray threads were no problem. It was interesting when it came to the yellow thread though. The perfect match was not found with the other yellows on the Aurifil thread chart. 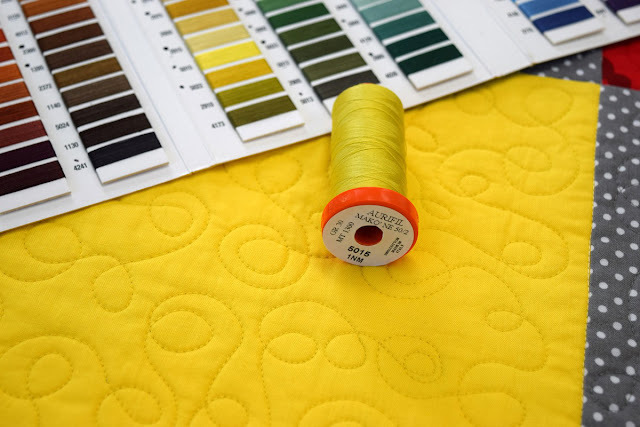 The best match, Aurifil 5015 in gold yellow was found over in the greens/ browns on the Aurifil thread chart. 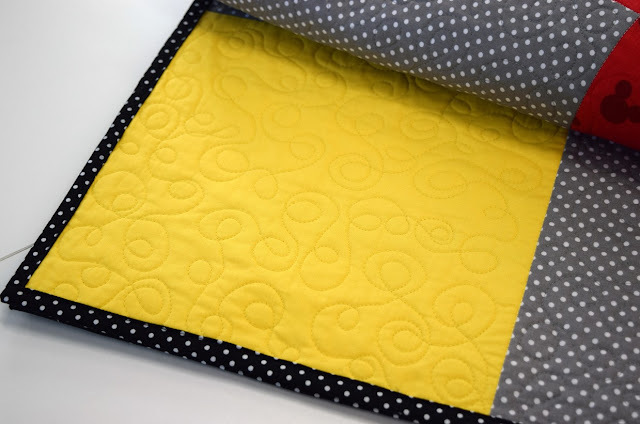 When quilted, it matched perfectly with Kona Cotton Solid in Canary. 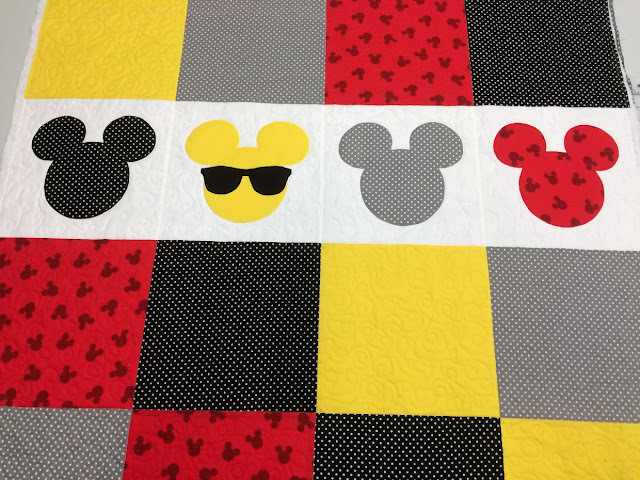 I debated whether or not to quilt in the the Mickey heads and if I did what would I quilt? The quilt show judge did mention that the Mickey heads would benefit from additional quilting and she's probably right. There was plenty of the black dot left so I decided on that for the machine sewn binding. I attached it on the back of the quilt and finished the topstitching from the front. The black binding made a nice frame for the quilt. 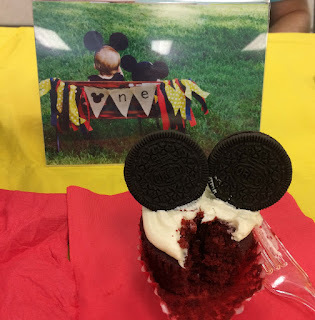 Mickey was the hit of the birthday party. There were even Mickey Mouse red velvet cupcakes. I wish I had taken a picture before I took a big bite out it. Linking to Finish It Up Friday with Amanda Jean at Crazy Mom Quilts, TGIFF at Devoted Quilter this week with Leanne, Whoop Whoop Friday with Sarah at Confessions of a Fabric Addict, and Show Off Saturday with Caroline at Sew She Can. What a bright and stunning quilt! So easy,too. You inspire me to get my grandson's quilt done. Thank you, Debbie! Yes, it came together fairly quick and was fun to work on with all the bright colors! This is just darling! I love the polka dot binding. I am sure that given his fondness and comfort he finds in Mickey that this quilt will be treasured, loved, and another source of comfort for him for years to come. Gifts like this are what quilting is all about, for me. I love this quilt design and execution! The quilting and the applique are wonderful! What a wonderful quilt and gift for your great nephew--so thoughtful. You're a double Great Aunt now. 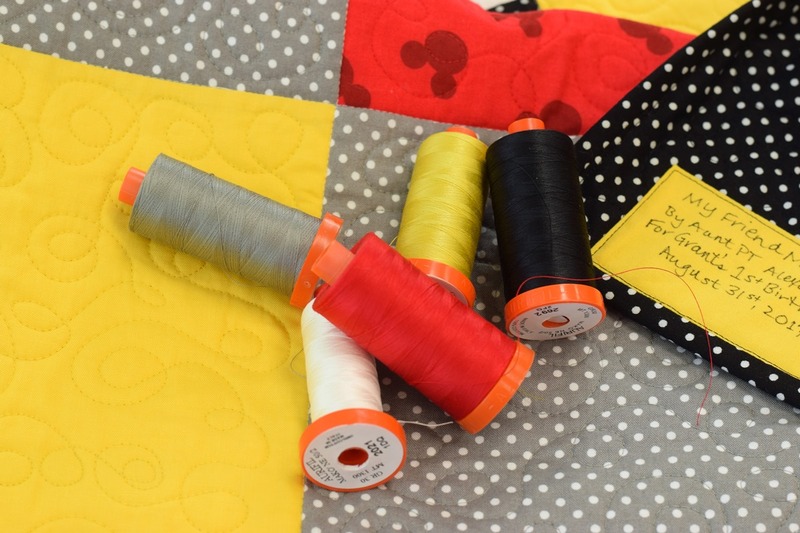 So nice you were able to find the perfect colors and fabrics for the Mickey quilt. BTW, the Waverly Gray Dot is one of my favorites and I keep a stash of it. I'm sure it will be loved for a long time. Thank you, Rita Lynn! I sure hope this quilt brings him a little comfort! A gift with so much love and meaning, this will be valued and loved for a long,long time. Great quilt! Those colors are perfect. So lovely, just what a Micky Mouse lover needs on his quilt. You did a wonderful job!! 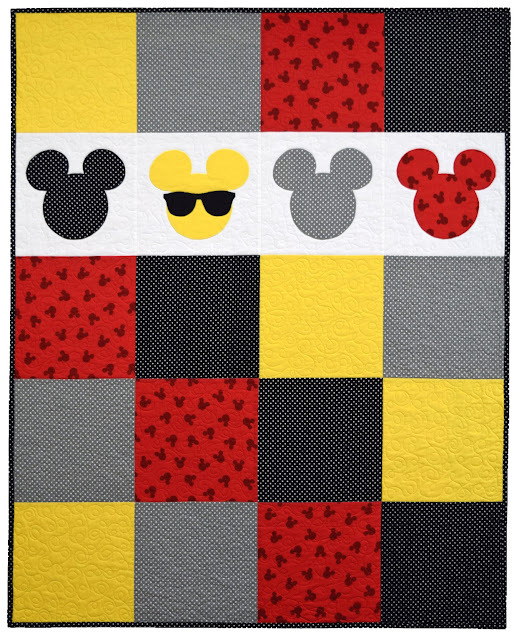 This is a perfect Mickey quilt. Well done! No wonder it was the hit of the party. 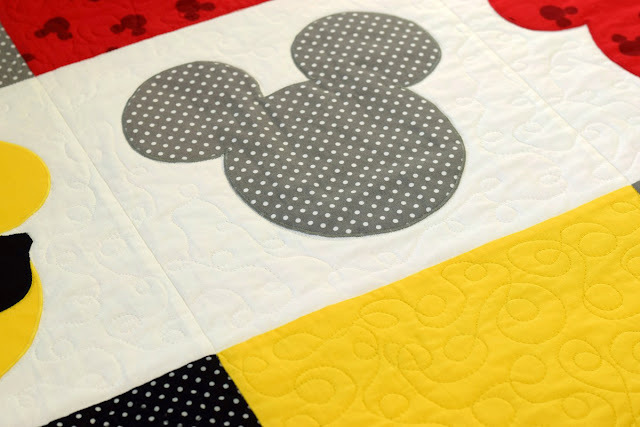 This is such a cute quilt and the perfect gift for a Mickey Mouse fan! I love the binding you picked! 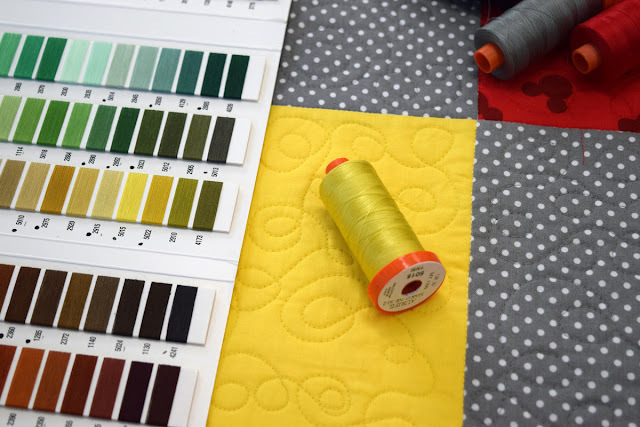 I've had the same experience with a greenish yellow being a better thread for quilting over yellow fabrics. 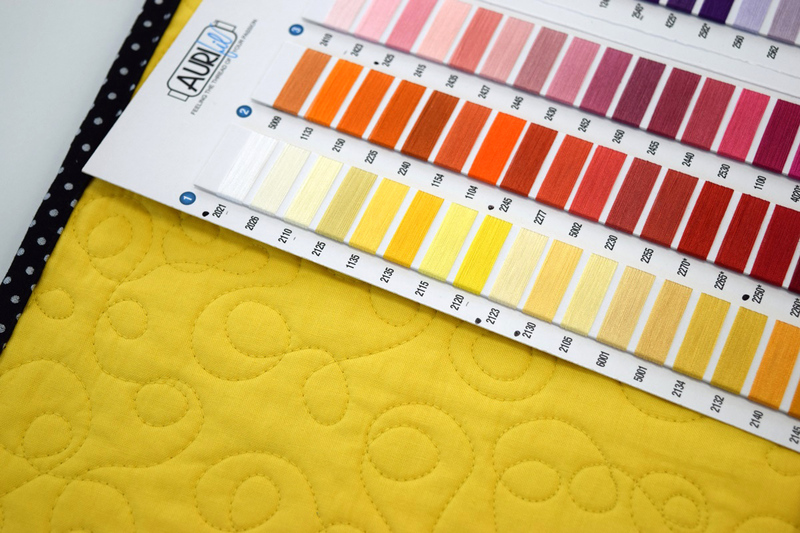 And yet a pale yellow is a fantastic neutral for quilting over lots of other colors. I wonder why that is? Gosh Paige! This quilt is simply adorable! And I think that's why it works so well... it's simple. The sunnies on Mickey's face are the perfect touch. I have no doubt your little friend adores this quilt. In fact, I know lots of "Mickey Fanatics" - a club here in The Villages - who would go nuts over it! You're sure a whiz-bang quilter! What a cute quilt, Paige! I'm sure he will love it for years to come. I love that Kona yellow; how strange that the thread was so difficult to match, but you found one that worked! That cupcake looks like it was very tasty. Mickey with the sunglasses is so adorable! What a great quilt for the little guy. It's funny sometimes which thread matches a fabric. It's not always the one you initially think it will be. What an awesome gift. I'm sure he was pleased. Well done. If you had found more Mickey fabrics I'm not sure it would have turned out so cute! Sunglasses Mickey is totally cool, by the way! Mmmmm... red velvet cake... This is such a cute quilt Paige. Nice work thinking outside the box and making your own Mickey silhouette. Very cute quilt, I love the Mickey heads and the bright fabrics. A wonderful quilt Paige, you have a wonderful understated style. I'm sure it will be much loved.